Ma Ying-jeou spent fifteen minutes at Ai Weiwei’s ‘Absent‘ exhibit at Taipei’s Museum of Fine Art on Friday. Hours before Ma’s visit, I posted this piece by Harry Wu criticising the human rights situation in Taiwan during the Ma administration. In that post, Wu wrote of “the silence of government associated sectors on the persecution of Chinese dissidents, including the vague attitude held by Taipei Fine Arts Museum towards Ai Weiwei’s arrest”. So, does Ma’s visit to the Ai exhibit represent a change of heart or tool for an ailing campaign? First of all we should recognize that, given the strategic context, this is one of those damned if you do, damned if you don’t moments for Ma. Having made détente with China the cornerstone of his successful campaign in 2008, Ma has had to tread a fine line when it comes to offering support to people and causes blacklisted by China. But this is also an ‘easy issue’ for domestic opponents to attack on, and it is a sphere in which the KMT has its own historical vulnerabilities, so he can’t be seen to be a total walkover either. Thus the Dalai Lama came to Taiwan (after much oohing and aahing), but was assiduously avoided by officials in the Ma administration. Ma issued a press release after Liu Xiaobo won the Nobel Peace Prize, saying that it was “not only an individual honor but also has great historical significance for the development of human rights in China.” Since information about Liu’s Nobel was put on lockdown in China, Liu Xia has since disappeared and Liu remains in jail somewhere, we can wonder what ‘development of human rights in China’ actually means. Indeed, these sentiments are the same as expressed in Ma’s yearly thoughts on Tiananmen-a fairly safe time to criticize the PRC as it closes its ears to everything outside of China on that day. But lest we castigate Ma too strongly for toeing the line when it comes to China, think of how many other world leaders, CEOs, universities and many others are doing the same. Ma has mentioned Ai Weiwei, publicly, twice in nearly four years; in his Tiananmen statement in June 2011 and when he visited the exhibit. Speaking to media at the gallery on Friday, Ma spent as much time referencing his Tiananmen statement as saying anything new. The line that 人權保障越接近，雙方距離就能更接近 (the closer the two sides are on protection of human rights the distance between them will decrease) is not new: its essentially the same old ‘when China becomes a democracy etc.’ wishful thinking. The ‘new’ was this: 艾未未是一位藝術家，藝術家應該有表達其藝術觀點的自由，這是臺灣重要的核心價值 (Ai is an artist and artists should have the freedom to express their artistic perspective; this is an important core value for Taiwan). That is a very clever workaround. 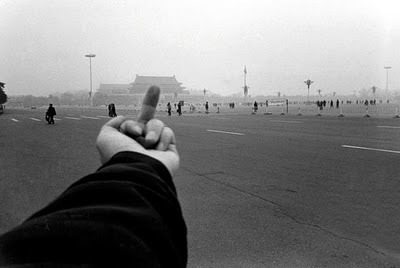 As I describe in this paper on Ai Weiwei’s precarious online communities, the cause of Ai’s problems with the Chinese government is not artistic freedom per se, but the fusion of his art with his activism. But Ma can spin his comments both ways; art as activism for domestic (Taiwanese) critics and “art as art” if China gets upset. It’s interesting that according to observers, Ma avoided “Studies in Perspective”. As if there is any other position for him at the moment, Ma was on the defensive at the museum. He first felt the need to explain/justify the reluctance/incompetence of Taipei Mayor Hau Long-bing in failing to invite Ai to Taiwan. He would soon thereafter have to defend criticism that this was simply a 选举秀 (lit. election show). One would like to think that Ma’s support for Ai Weiwei is genuine, and I have no reason to doubt that on a personal level it is. But several things point to instrumental motives. As documented on this blog, Ma’s campaign is in trouble, and frankly, it needs all the positive distractions it can get at the moment. Taking up a cause celebre that could show Ma as a strong leader not willing to sell-out Taiwan’s core values, seems like a pretty good idea to me. Especially given how the disastrous ‘peace accord’ gambit failed utterly to resonate with voters (indeed, following National Chengchi University’s Center for Prediction Markets, it could be responsible for Ma’s big poll drop through October). And frankly, whatever Ma says during the campaign, China is not going to hold it against him and start wishing for Tsa Ing-wen to win. Maybe a better test of Ma’s new taste for human rights is to see whether he mentions any of China’s detained rights defenders–who are also emblematic of Taiwan’s core values?